I’ll keep this short, because Freakonomics is a pretty simple book. It takes a look at various topics—the effect of names on success, drug dealer salaries, cheating in sumo wrestling, etc.—through the eyes of an economist. This book is a few years old (and has a sequel out now), and it took me a while to get through it, mostly because it’s been my “sit on the bedstand and read for a few minutes before bed” book for a long time. And that’s the ideal context for it. Read a few interesting facts, go “huh, that was interesting,” then put it aside and go to sleep. There’s some weird deifying of Levitt that just feels out of place, but aside from that, the authors do a good job of merging interesting anecdotes with potentially dry number crunching. The accuracy of the conclusions is sometimes questionable, though. While there is a section about the difference between correlation and causation, causal claims based on correlational data are still presented with more certainty than is warranted. Much has been made about some of the more controversial topics in here, such as racism, and abortion. For example, they claim that legalizing abortion can lead to a drop in crime rates years afterwards. This may be true (or may not)—and certainly this fact should inform moral judgments about abortion—but the fact itself has no morality attached to it. Presenting such a fact is not a moral stance. Information itself is neutral; it’s what we do with it that determines morality. 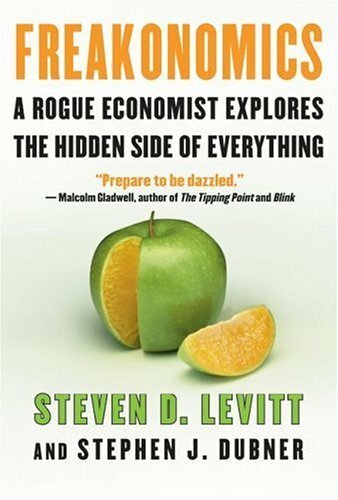 Anyway, I’d recommend Freakonomics as a nice little entertaining read for anyone interested in some offbeat conclusions that have been drawn from studying economics. I wouldn’t take it any further than that.